Hearsay social has launched a new solution designed to make it easier and faster for financial services companies to enforce compliance policies. The solution, dubbed the Universal Supervision experience, is available to compliance and supervision users of the company’s Predictive Social Suite. The solution provides users with a contextual review interface that makes the process of monitoring advisor social media and website activity more efficient by streamlining common workflows and surfacing contextual information critical to a supervisor’s day-to-day activities. "Instead of just building tools that mimic existing workflows, we work closely with our customers to build solutions to streamline their work," said Hearsay Social CTO and Founder Steve Garrity. "The new Universal Supervision experience brings the relevant information and tools into one view so that supervision professionals are able to use their time more effectively." To develop the new Universal Supervision solution, Hearsay Social worked with compliance and supervision users of its Compliance Solution. The company also studied review patterns across many financial service organizations to gather information on what tasks slow down the supervision process and what can be done to improve daily efficiency. The company also focused on enhancing the activities where users spend the most time. 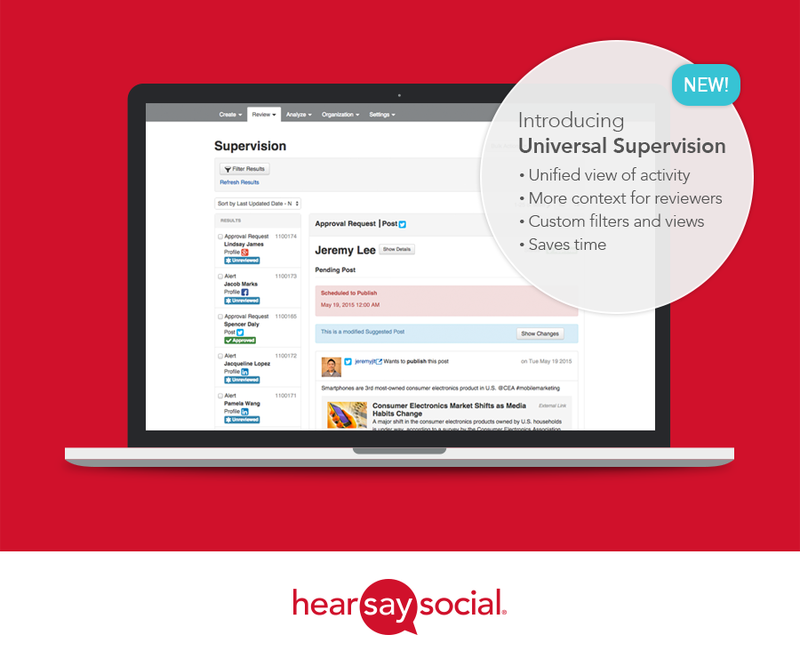 It is important to note that Universal Supervision also features filtering options, enabling users to build custom and saved views so they can see the most relevant information quickly. Plus, the system can detect compliance and users’ roles and permissions in the organization to only display relevant items. Through the solution, users have access to a single dashboard, which includes contextual information around an advisor’s activities and content so that supervisors have a complete view of advisors. Moreover, users can see what was previously approved on Hearsay Social and what change was requested by the advisor, which helps supervisors make informed decisions on actions in review. This makes the approval process more efficient. In addition, the system highlights content adds, edits and deletes for easy identification.